As this is the last day of SF Beer Week, and seeing as I have been too lazy to participate in any of the official events, let me leave you with this parting thought: Beer does not belong in mixed drinks. Yes, I realize that this is just my personal opinion, and that there really is no right or wrong way to enjoy your beer…wait, what am I saying? Of course there’s a wrong way to drink a beer. Honestly, I think people who go around throwing beer and lemonade together have some serious judgment issues, despite the fact that this opinion calls into question my Austrian heritage. Add ingredients together in a chilled beer mug, pouring the beer first, then the ginger beer. Since Interpol clearly has done nothing to thwart the thriving popularity of beer mixing, I expect you to recognize it by a few of its many names: in the U.K. of course, the Shandy; in Germany the most common is the Radler (beer and lemonade/soda); and in France, it’s called the panaché (beer or ale and French style lemonade). Though I see no end in sight to this decades-long trend, you can still do your part. Resist. 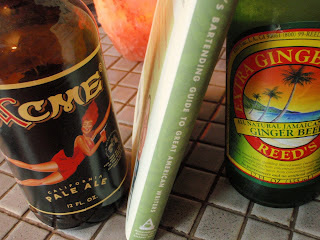 *If you need to doctor your ginger beer, try: lime, Irish whiskey, bitters, dark rum, or spiced rum — but please, not beer.